"I have been training MMA for 10 years. Initially, there was no opportunity for women to compete but I was determined that one day I would fight for EFC." We're all too familiar with lack of representation according to gender lines, the stock markets have been no different. Just like how the EFC is changing the landscape of MMA to have more women competitors, EasyEquities aims to have more representation in the markets as well. With 32.71% of investors in the EasyEquities Tax-Free Savings Account being women, we're seeing the investing landscape take shift on our very own platform! Dr. Eliasov goes on further to highlight one of her more prouder moments in the sport, "I was the first female athlete to be signed by EFC, which was a huge honour. I went on to win my fight as the first female athlete to compete as a professional in South Africa." Danella had continued training in Mixed-Martial Arts without even knowing whether she would be allowed to compete, but she persevered. Focusing fully on psychiatry now, Danella still finds the time to balance training in her passion, MMA, with her work. "It had been hard fitting in time to train [and fight] as well as study medicine, later psychiatry, and ultimately to run my own practice and see patients while training. I definitely see this as an investment rather than a sacrifice." Speaking of investing, and to some extent - sacrifice, time is always a major factor in the markets. Very often, investors are sacrificing money they have (at present, or in the past), for more money in the future. "I was given the opportunity to fight professionally later in life than I would've liked." This response emphasizes the power of spending more time in the market, with many investors I have spoken to wishing to have started earlier. "I have learned not to give up on a dream just because people around me may say it's not possible. I was told women would never be successful in MMA. I'm glad I didn't listen, and proved those people wrong." She continued. Besides MMA, I wanted to know what other hobbies the doctor has that nobody would expect of her. She's would highlight her love of traveling and experiencing the different cultures around the world. Some of which include Iran, Tunisia, and Bhutan. "I am off to explore an island in the arctic called Svalbard in the next few weeks." Outside of her travel plans, Danella will focus on coaching boxing & MMA at Fight With Insight, an open access gym in Hillbrow which offers various programs to "assist children with autism, mood and anxiety disorders and other behavioural problems." 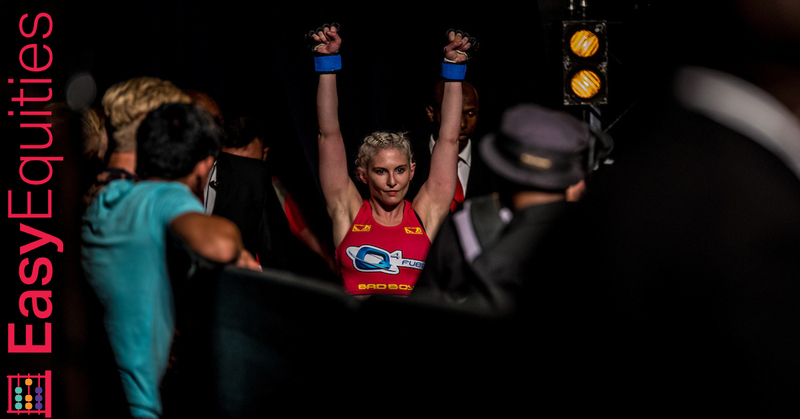 This new venture mixes her experience in psychiatry with her love for MMA, in a move that should see her give back to the community in a massive way. This combination reminds me of those investors on EasyEquities who use their know-how in a field they work in to shape their investment strategies. "Bulls or bears?" I asked. "I have to admit to being a bit clueless when it comes to the financial world." Just as Dr. Danella Eliasov has shone light on MMA sport to the #EasyCommunity, we aim to educate everyone in the Mixed-Martial Arts community about the stock markets and investing. Stand a chance to train among the elites and win R5 000!